The Colosseum can be accessed from the player's interface. 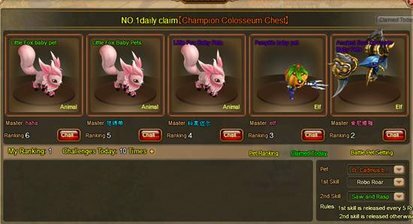 In the Colosseum players can select the Pet they wish to use as well as its skills. Players can then choose which other player's Pet they want to battle with. Players will be ranked based on how many wins/losses they have, each day they will receive a reward based on their ranking. The top 3 ranked players will receive special rewards.